The Aloe Vera aloe is a tropical succulent with spotted, spiked, grey-green leaves. 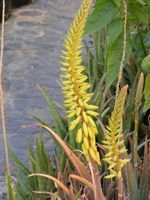 It is drought-resistant and grows in well-drained soil, preferring full sun to partial shade. Aloe Vera is frost tender. It should be grown as a house plant in cooler regions. If grown in a pot, plant it in a gritty, friable mixture, keep it in good light and feed once a month throughout the growing season with liquid fertilizer. In winter, keep watering to a minimum. 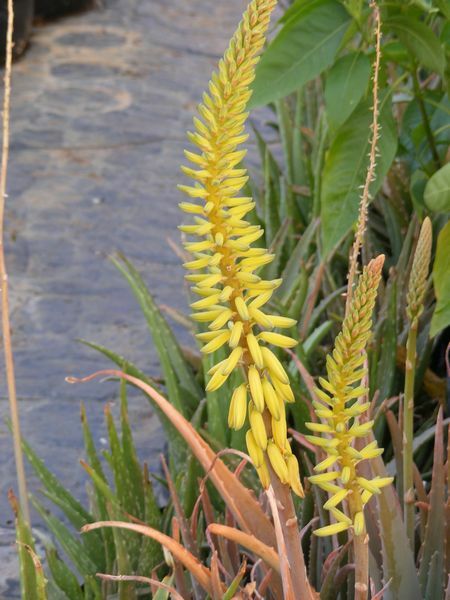 Aloe Vera can be propagated by breaking off small rooted plantlets at the base of a mature plant and replanting them. Aloe Vera was mentioned as early as 1552 BC in the Ebers Papyrus and has been identified in wall paintings in ancient Egypt. Aloe Vera was introduced to Europe in the 10th century. It was first mentioned in Chinese medicine the 11th century. Today Aloe Vera is propagated all over the world and used in cosmetic, tanning and skincare products. Cut a well developed fresh leaf. Store it while in use in an airtight container in a refrigerator. Plants older than 2 years have stronger medicinal properties. The clear gel in Aloe Vera leaves, contains Aloectin B which stimulates the immune system. It is therefore beneficial to drink Aloe Vera juice. To soothe minor wounds, burns, sunburn, scalds, scrapes, irritated skin, ulcers, eczema and fungal infections like ringworm and thrush — break off a leaf from an Aloe Vera plant, split it open and apply the thick gel directly to the affected area. It will form a protective coat on the affected area and speed up the rate of healing and reduce the risk of infection. If taken internally, it is an anti-parasitic. Take one Aloe Vera leaf, peel the outer skin off with a potato peeler and place it in a blender. Pulse to reduce to a gel. Add 4 drops of lavender essential oil for every 50ml gel. Mix thoroughly and pour into a small glass jar and label. It can be stored in the refrigerator for up to 3 or 4 weeks, thereafter discard and make a fresh batch.